LAS VEGAS - As small time mobster Rick Rizzolo watched, Clark County District Court Judge Mark Denton last Tuesday ruled to uphold the unanimous vote of the Las Vegas City Council that permanently revoked his Crazy Horse Too strip bar's liquor license thereby ending twenty years of bloodshed. Five days earlier, the same judge denied Rizzolo's motion for a Temporary Restraining Order against the City. Sources close to the case say Crazy Horse Attorney Tony Sgro, in order to convince Rizzolo and 15 of his thugs to plead guilty to felonies, promised that when they return from prison, their blood soaked bar would still be in operation, albeit, in the hands of a straw boss, and that they could return as hidden owners and continue bashing heads. Then the sky fell in. Sgro opened his lightweight argument before Judge Denton by saying the City violated his client's rights by conducting the license revocation hearing in public. He said the hearing should have been conducted in private behind closed doors. Then he said that (his mentor) Mayor Oscar Goodman had had a change of heart and, after the fact, decided he had no conflict of interest and should have presided over the Council hearing. The judge was not impressed. While Sgro droned on and on, award winning Review-Journal photographer Clint Karlsen snapped dozens of photos of a droopy eyed Rizzolo watching his empire shatter like an egg. Visibly shaken after hearing Judge Denton's ruling , Rizzolo's pal, 72 year old Fred Doumani, needed the bailiff's assistance to exit the courtroom. Rizzolo didn't fare much better as he brushed off reporters during his retreat to his car. 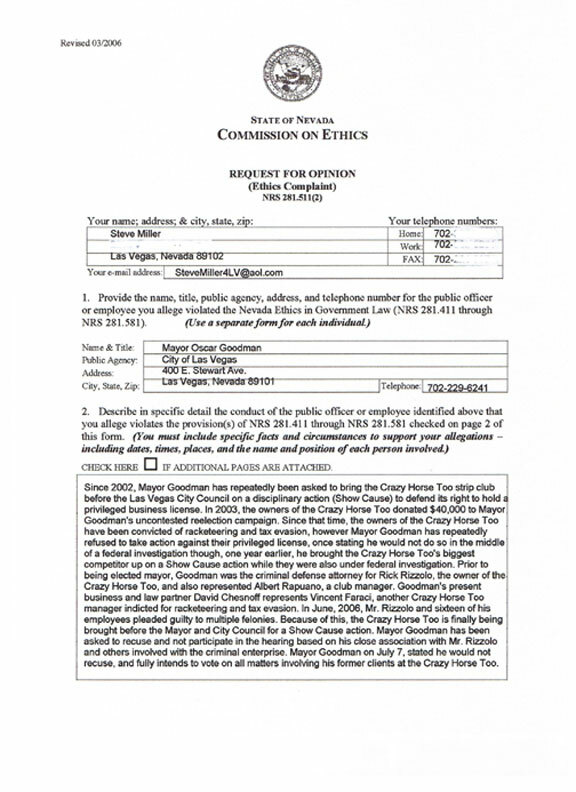 My July 10 complaint to the State Ethics Commission was the straw that broke the Horse's back. The complaint forced Rizzolo's former criminal defense attorney Mayor Oscar Goodman to abstain, and cleared the way for the rest of the Council to -- without his powerful influence -- do the right thing. Now seeing the empty parking lot in front of the once bustling criminal enterprise, I can't help but remember back when Rizzolo seemed to have the world dangling on a string of hundred dollar bills. In 2001, he sued me and my publisher for breaking the story of the crippling of Kansas tourist Kirk Henry. He was so concerned that his reputation would be injured by my reports that he authored the following Letter to the Editor in the weekly newspaper I then wrote for. Here's Mr. Rizzolo's letter in its entirety. Though it reads more like a letter from his attorney, Mr. Rizzolo's signature was affixed as the author. So you're not mislead, please read my response. I've linked to it at the end of the letter. On September 25, 2001, the Tribune published an article entitled, "Racketeering Charge Against Rizzolo Sticks," written by Steve Miller. In no way could this article, with its false and misleading information, be considered a news article worthy of publication in a "real" newspaper or even on the Internet. These lies have injured us and our reputation; we demand and, in the interest of truth, must be provided with a retraction, as well as publication of this letter. This article and Mr. Miller, who owns and utilizes this newspaper as a vehicle to attack business and political competitors, does nothing but mock real journalism. Not only does this paper fail to report that Mr. Miller owns the newspaper for which he is its most prolific writer, but also fails to report the extent of Mr. Miller's interest and involvement in the lawsuits he discussed. The Las Vegas Tribune and Mr. Miller fail to disclose that Mr. Miller is the landlord of Club Paradise. Club Paradise, an adult dance establishment, is a direct business competitor of the club I operate, Crazy Horse Too. A mere glance at the titles to Mr. Miller's articles clearly reveals Mr. Miller's bias against his competitor, the Crazy Horse Too and myself, and his complete lack of journalistic professionalism. Mr. Miller, unlike the true newspapers of this city, has devoted much of his time and energy to writing articles about me and my club. What Mr. Miller omits, in addition to what he chooses to write, in these articles are tell-tale signs of Mr. Miller's agenda. In every Miller article devoted to myself or to Crazy Horse Too, Mr. Miller, in violation of what every first-year journalism student is taught, presents only one side of the story. For example, while quoting directly from complaints filed against me, Mr. Miller has never quoted the complaint I filed against him or his personal friend, James Barrier, When Mr. Miller does deign to mention those complaints against him, the reference is brief, cursory, and buried somewhere towards the end of the article. It is no surprise, of course, that one will not find a single article in the Tribune reporting any event or fact favorable to myself or to my club. In many of his articles, Mr. Miller claimed that he sought comments from me. With this letter, I now present Mr. Miller and the Tribune my comments to those articles and, if the Tribune has any integrity, it must publish this letter without changes. Also in every article devoted to myself or my club, Mr. Miller continues to make unsubstantiated statements or make tenuous connections to unrelated events in an attempt to show that I somehow run the City of Las Vegas, including its prosecutors, the police and fire departments, the judges, and the City Council. In his October 2 article, Mr. Miller wrote that "It is well known that City Councilman Michael McDonald takes his marching orders from" me. (If this "fact" was so well known, Mr. Miller could have easily quoted someone, but Mr. Miller did not do that since such an attempt would actually involve real investigative journalism.) Of course, Mr. Miller does not substantiate such allegations except by connecting me with McDonald, McDonald with Cusamano, and Cusamano with me. Mr. Miller, as customary, omits circumstances which would reveal his bias against Councilman McDonald. Although Mr. Miller repeatedly reminds his readers at the end of his editorials that be was a former City Councilman, Mr. Miller conveniently forgets to mention that he lost his seat to Councilman McDonald, who shares the spotlight that Mr. Miller likes to place on me. Mr. Miller, or this paper, could have no justification for publishing false and misleading information, especially considering Mr. Miller's inside information, Mr. Miller is a party to the lawsuits and has been privy to all information. Everything Mr. Miller reports is also public information and requires no diligence or investigative reporting. Yet, Mr. Miller, in. his article, omits, skews, or outwardly lies about pertinent information. For example, in paragraph two of the September 25 article, Mr. Miller wrote that the attempt to evict Barrier was unsuccessful and that the eviction suit was brought to expand Crazy Horse Too. To the contrary, Barrier would have been evicted had he not agreed to comply with his landlord's and the law's demands. Those demands included refraining from dumping toxic chemicals in and around the property, refraining from parking his junk automobiles in neighboring private properties and common areas, and taking down a big belching mechanical buffalo that was deemed an environmental nuisance. The eviction was also brought because Barrier has been operating an automobile body shop without a license. The eviction suit was not brought at all by myself or as an attempt to expand the Crazy Horse Too. The architectural drawings depicting expansion into Mr. Barrier's leaseholds, referred to in paragraph twelve of Mr. Miller's article, were prepared long before Crazy Horse Too expanded in the other direction and certainly long before the Department of Transportation (DOT) announced possible plans to widen Industrial Road. The DOT has not even scheduled this purported expansion. Ironically, it is not our leasehold that is in danger of being substantially reduced by the DOT expansion; it is Mr. Barrier's leasehold, which is closer to Industrial, Widening Industrial would essentially eliminate Barrier's property. Undoubtedly, Barrier is willing to negotiate and sell his leasehold that may not be there in a couple of years. In any case, if Mr. Miller had actually done some investigating, as any reporter would do, and contacted the architect of those plans, Mr. Miller would have discovered two sets of plans for the expansion of Crazy Horse Too, one northward and the other southward towards Mr. Barrier's leasehold, both of which were prepared well before the proposed DOT expansion. Contrary to Mr. Barrier's claim, I did make an offer to Mr. Barrier when I was still contemplating these two options for expansion. When Mr. Barrier sought a ludicrous multimillion dollar purchase price, a price that was ten times more than what his actual leasehold was worth, I decided on a northward expansion and purchased the adult bookstore that was next to Crazy Horse Too, Once Crazy Horse Too expanded northward, there was no reason and no need to purchase Mr. Barrier's leasehold. Thus, contrary to the article's title, the racketeering charge against me has not "stuck." In the eighth paragraph of the September 25E article, Mr. Miller wrote that Judge Nancy Oesterle dismissed the eviction action brought by Barrier's landlord Renata Schiff. Again, this is incorrect. Judge Oesterle did not dismiss the action; the court was divested of jurisdiction when Barrier and Mr. Miller filed for declaratory relief. Additionally, it was not "by coincidence" that the libel action is also assigned to Judge Saitta. The cases before Judge Saitta have been consolidated and are being heard by one judge because they involve the same matter, Mr. Miller had unsuccessfully attempted to remove Judge Saitta, but a different and independent judge, Judge Ron Parraguirre, found that Mr. Miller had acted improperly in doing so. In the fifth paragraph of the article (and in two October, 2001, articles) Mr. Miller misstated the facts of another case, facts which are again available to the public. Contrary to what Mr. Miller wrote, Mr. Fau was not found beaten to death. Mr. Fau was not even dead when he was found. Contrary to what Mr. Miller chooses to report, the coroner who examined Mr. Fau's body could not determine the cause of death but completely ruled out that Mr. Fau was beaten to death or that his death was caused by an altercation. Mr. Fau, with his friend, had come into the Crazy Horse Too in an inebriated state and threatened and harassed my bartender, When my employees were attempting to eject Mr. Fau, who was at least six feet tall and weighed 300 pounds, from the club, Mr. Fau took off his belt, wrapped it around his hand, and struck one or more of my employees, injuring them. Two of my employees eventually had to go to the hospital for those injuries. The police had to be called in and it was the police who ejected Mr. Fau and his friend from the premises and saw these two people walk southwards away from the club. At least three hours had elapsed before Mr. Fau's body was found on the train tracks far from Crazy Horse Too. Mr. Miller also refers to another alleged beating that occurred at my club on September 20, 2001. No "beating" ever occurred on my premises on that day. A customer leaving the club drunk did trip, but in no way was this man "beaten," About the only accurate fact reported by Mr. Miller was the club personnel were standing over the injured man. Of course, Mr. Miller does not mention that my employees were assisting the injured man, as that would ruin his insinuation that my employees had "beat up" this man. It appears that Mr. Miller's omissions of the pertinent information discussed above was necessary to preserve the very purpose for the Tribune's existence. That purpose is not to report the truth but to provide Mr. Miller an outlet to attack those he considers as "enemies" or competitors. Unfortunately, Mr. Miller attacks more than just enemies; he mocks the public, the public's intelligence, and real journalism. With this unethical twisting of the truth, Mr. Miller and the Tribune disgrace even Yellow Journalism. Since his letter was published, Rizzolo and his corporation pleaded guilty to several felonies including Racketeering; Councilman Michael McDonald was named a "Subject" in the FBI's "Operation G-Sting," then ousted from office; Buffalo Jim Barrier's auto garage is the only business still operating in the strip center he once shared with the Crazy Horse; and Scott Fau's widow and daughters are hoping to bring a new wrongful death lawsuit in Federal court. 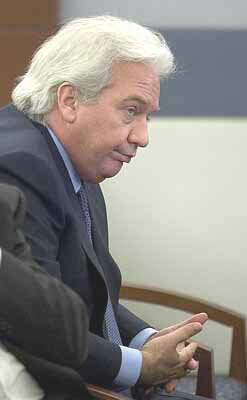 Rick Rizzolo awaits sentencing on Oct. 23. He faces up to up to five years in Federal prison. Undaunted and still charging by the hour, Rizzolo's lawyer last week told reporters he thinks he can find a legal reason to cause the City Council to bring the Crazy Horse license revocation back for reconsideration based on material evidence he allegedly left out of the Sept. 6 - four hour Show Cause hearing; Sept. 8 - two hour Temporary Restraining Order hearing; and Sept. 12 - four hour Preliminary Injunction hearing that all came to the same conclusion: close the Crazy Horse before anyone else in injured or killed. Sgro couldn't make his case in ten hours of testimony in front of the City Council and a veteran Judge, so why does he think he can succeed if Goodman somehow presides over a rehearing? With tens of millions of dollars at stake, you're guess is as good as mine. But keep in mind it was Rizzolo who, if he had not plea bargained and skipped having to go to trial, faced several counts of political corruption in addition to racketeering and extortion. Sgro cited that the vote would probably have gone the other way had Goodman not abstained, and that the Mayor had a change of heart saying he now believes he did not have a conflict of interest and should've voted to keep the place open. His reasons were not clear -- something about his law partner David Chesnoff, who represents Crazy Horse manager Vinny Faraci, and him splitting up their law practice, and the after the fact removal of "Oscar B. Goodman, ESQ., of counsel" from the letterhead of Goodman and Chesnoff. Also, that a man (with alleged ties to organized crime) named Stuart Cadwell has purportedly agreed to pay $45 million for the bar that had previously been offered for $30 million, and that the offer was mysteriously put in writing only one day after the Council's license revocation vote. Because both of the above reasons occurred after the vote to revoke, it will be very difficult to convince the City Attorney that Rizzolo and Goodman should get another bite of the apple. In the meantime, the violence has stopped. And Sgro continues to insist that Rizzolo does not have the financial wherewithal if the bar stays closed to pay off about $16 million in debts to the IRS and beating victim Henry. (Henry is the man Rizzolo refers to in his letter as "A customer leaving the club drunk did trip, but in no way was this man 'beaten.'" However, Sgro neglects to mention that in 2005, Rick and Lisa Rizzolo divorced in the middle of the Federal Investigation and after Kirk Henry filed his attempted murder lawsuit. In such divorces, settlements designed to protect assets can easily be reversed. 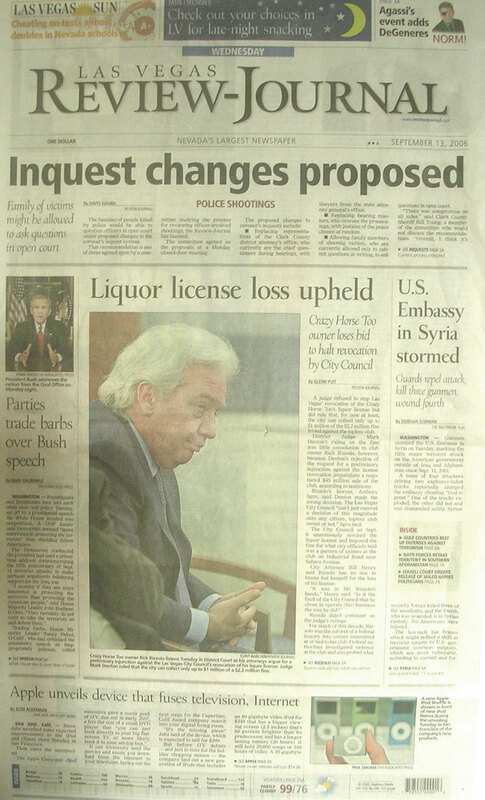 Las Vegas Sun investigative reporter Jeff German on August 5, 2005 wrote a column that spelled out the divorce settlement and laid to rest any sympathy one might have for Rizzolo not being able to pay his agreed upon debts. According to a copies of the decree and the petition, Lisa Rizzolo, who is keeping her married name, makes out incredibly well in the deal, as the feds continue to probe her husband's financial affairs. She gets the couple's 5,763-square-foot home in Canyon Gate, appraised at $944,760, as well as a $1.4 million oceanfront home in Newport Beach, Calif., and a condominium in Chicago that Cook County records say had a market value of $192,638 in 2003. Lisa Rizzolo also gets two "Oppenheimer" investment accounts that were holding $7.2 million when the divorce petition was filed in court. And, starting in January, she receives $83,333 a month from her ex-husband over the next five years. That adds up to $20 shy of $5 million. Also part of the deal are three luxury cars being put in her name -- a 2002 Mercedes S600 and two late-model Range Rovers. Rick Rizzolo also is continuing to pay for his "incompatible" ex-wife's health insurance, and he's making her the sole beneficiary of his life insurance policies. One thing Rizzolo is holding on to is the Crazy Horse Too, which he said under oath in a July 20 deposition grosses between $800,000 and $1 million a month. He's also keeping a 2005 Mercedes SL65 and a classic 1958 Corvette, as well as "real property and related structures" he owns in Philadelphia. Based on the above, instead of insulting our intelligence by arguing that the same goons who broke their client's neck should be allowed to remain in business, attorneys Don Campbell and Stan Hunterton should immediately file a lawsuit against Lisa Rizzolo to whom her embattled husband transferred his wealth to avoid paying the Henrys. This way Campbell and Hunterton can get their deserved legal fees, and recover Henry's personal injury damages, while negating the possibility of there ever being another Kirk Henry-type attack on an innocent tourist. Last but not least is the status hearing on Rizzolo's DEFAMATION OF CHARACTER lawsuit against Buffalo Jim Barrier. It was scheduled for Monday, Sept. 18, but has been temporarily postponed. I will let you know when it's rescheduled, and the outcome. Coincidently, Rizzolo's libel suit against me was dismissed, but his libel action against the Tribune is ongoing, as are Sgro's legal fees. The Tribune now editorializes in favor of Rizzolo. Meanwhile, even with the procrastinated help of the Mayor, all the King's men can't put Humpty together again.